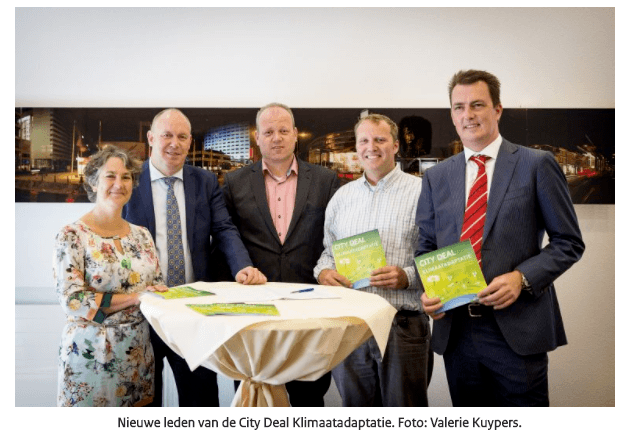 City Deal Climate Adaptation is a cooperative between public partners and (semi)private cooperation partners focused on achieving a breakthrough in the approach to climate adaptation in Dutch cities. The Hanze University of Applied Sciences is involved in order to work more effectively on climate-resistant cities, from Hoogeveen to Manila. The City Deal Climate Adaptation is working on the Spatial Adaptation delta decision: development, realisation and management of urban areas are to be standard practice in 2020. The City Deal Climate Adaptation does this through specific pilot projects, elimination of policy barriers and sharing and exporting knowledge.